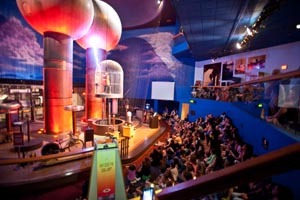 The Boston Museum of Science boasts an extensive collection of exciting science-based exhibits, both permanent and temporary. In the main Museum of Science building, check out the natural animal habitats offering hands-on taxidermy, real chickens hatching from their eggs, a replica of the first space capsule. and a butterfly garden (additional fee). For little ones, the Boston Science Museum has a Discovery Center located directly across from the musical stairs offers a safe, enclosed play area specifically designed for children under five. There are two floors to explore, with tunnels, puzzles, an interactive light stick design corner & puppets. Terrariums, some of which have transparent domes, allow toddlers to safely view little animals in their natural environment. The Van de Graaff generator provides a risk-free opportunity to witness lightning at a close range. Lightning shows are daily at 12:00 noon and 2:00pm with a 7:00pm Friday show. The Planetarium at the Boston Science Museum is a high-tech, celestial adventure and the most technologically advanced planetarium in New England. Please click here for showtimes. Science really comes to life with the new state-of-the-art Science Live! Stage. The stage, designed especially for live animal and multi-media presentations, is surrounded by natural history dioramas and equipped with Dolby surround sound, a computer-controlled lighting system, a LCD projector, and a microscope-mounted camera. The Mugar Omni Theater at Museum of Science presents larger-than-life images on a domed screen that reaches five stories high. It’s New England's only 180-degree IMAX® dome. With a new digital sound system, seats and carpeting, the Mugar Omni Theater is better than ever. For advance credit card reservations please call 617/723-2500. The Gilliland Observatory, located atop the Museum of Science’s garage roof, is open for free viewing on Friday evenings, first-come, first-served. Visitors are encouraged to attend the Friday 7 p.m. planetarium showing of “The Sky Tonight” as background for the viewing session. Call the Gilliland Observatory Hotline for viewing status and hours at 617/589-0267. Friday evenings, approx. 8:30-10:00 p.m., weather permitting. Museum of Science is a Duck Boat departure site . . . Boston Duck Tour tickets can be purchased in advance on their website or (617) 267-DUCK (March 29 – November 28). $25.00 for adults, $20.00 for children 3-11, and $21.00 for seniors 60+. Parking is available at the Boston Science Museum for 1,000 cars. Hourly rates apply. The garage fills up on busy days, and may close temporarily until spaces become available. Come early (before 11:00 a.m.) or late (after 4:00 p.m.) If you come late, be sure to order your tickets in advance. Take public transportation if you can: Green Line to Science Park. Ordering tickets online will save you the wait in line when you arrive. Simply go to the yellow 'reservations' line and breeze through the crowds waiting to purchase tickets. The annual Museum of Science membership is well worth it if you plan to visit the museum more than once. It offers 2 hours of free parking for each visit, guest passes, and passes to the planetarium and the Omni theatre. You also can visit select science museums nationwide at no additional cost. The food court at the Museum of Science offers some pretty good faire (Wolfgang Puck's pizza is worth a visit). The Theatre of Electricity offers two shows, Lightening, and Battle of the Currents. The Lightening show gets you remarkably close to this striking phenomenon, but loud bangs might frighten the under 5 set. The alternative show Battle of the Currents is less loud, but may bore some kids as it's more of a discussion than a show. This past weekend, my nephew from Los Angeles, CA came for a short visit. If only we had time, I would had took my children and their cousin to the Museum of Science. One said, 'Oh we've been there a lot of times but they always have lot of interesting exhibit and different event each time we go. (Got interrupted) And and and...I love their huge gift shop, said the little one. We love this museum! Our favorites are the Live Animal shows, the hatching chicks, tamarin monkeys, the IMAX movies, the shuttle simulator, and the electricity show. We also love the Butterfly Garden and the musical staircase. Parking is really cheap just a few blocks away at the mall. Also easy to get to by train. We have an annual pass and we always love our visits. Right now the museum has a great new exhibit Frogs: A Chorus of Colors, with dozens of really unique species from all over the world. My wife and I took our nieces and nephew last week and they loved it, and so did we! (As they say in their commercial, 'It's ribbeting!') We saved $2 off each child's admission through an online frog trivia game the museum has created. You can find it at www.FrogsCaravanOfColors.org. While you're there you can also sign up to win tickets and some other things. Definitely worth checking out the exhibit and the coupon! There is always something neat to discover here. Over by the planetarium they have a really cool planet center that has models of all the planets to scale with each other and the sun. Daunting to see just how tiny the earth is next to Jupitor and the sun! We also enjoy the light models of the solar system, the galaxy and the universe as we know it. We haven't been to a planetarium show yet - perhaps this will be the year. The Museum of Science is our family's favorite. Our kids really enjoy visiting the Human Body Connection room. There is lots to discover there - my daughter especially likes watching the chick hatching station. In addition, there are all sorts of models of human body parts, so kids can learn about the circulatory system, the ear, the teeth and decay (great for a lesson in tooth brushing!) and of course skeletons. In addition, there is a cool glassed in room with four tiny monkeys to watch - always fun. We got a museum membership this year and plan to use it as much as possible. It's also fairly easy to get to from the burbs, both by car and by MBTA. Both of my children have a ball at the Children's Discovery center. There is so much to do in there. From the discovery boxes (big boxes of nifty things to explore like magnets or bones) and the experiment station to the waterfall play area and the animal dress up centers - you just can't lose. You can stay there for hours. What a wonderful place. I went to the Robot Exhibit today w/my 4 yr son who just loves robots. We were both very disappointed! Not what we thought it would be. Only 1 robot to play with. Everything else was something you had to read about. Today I went to the Museum of Science with my mother and sister. I loved learning about the different things that have to do with science. The new exhibit was very interesting we learned a lot about different things that happen in our bodies. I loved the lightening show, it can be very loud, but if I covered my ears, it's okay, but it's so cool. My favorite part of the museum is the science in the park exhibit, there's so many fun things to do there like race against a light, testing your strength, and spinning the tires. I'm looking forward to the next visit and learning more especially with the next exhibit. I wonder what the next exhibit is going to be. I liked the playground a lot. My favorite part was the spinning and the running thing. I also liked the lightening show. I also liked the animal show. The museum of science has lots of cool stuff. I saw the dead sea scrolls. I saw a short movie about sea creatures. We made trampolines out of elastics and wood and tested them out. The museum of science is a fun place to go. We walked up and saw a giant model of a Dinosaur and a Duck boat. When we went inside we went to the special exhibit, Pixar. I thought it was awesome to see how pixar works and I even got to make my own mutant toy. After that we went to the lightning show, it was so cool because the guy never got hit with lightning and the lightning played music from Star Wars. After the lightning show we went to the computer room and I built a bunch of circuits and learned how they worked, it was so awesome. Next we went to the science in the park exhibit, it was so much fun I loved trying to beat the light in a race. I also had fun spinning myself crazy there til I was dizzy. We built fish in the fish room and created shadows in the light room. I had so much fun and I can't wait to go back again. During my trip to the Museum of Science I got to see many great things! The first exhibit I went to see was the Pixar room. This room was neat because the stations were all from different Pixar movies that I have seen. One of my favorite parts of the museum was the dinosaur area. I got to see Cliff the dinosaur and look at how big their bones were. I also got to do an activity to help the people out with a research study. I had to look on a computer at different 2D and 3D images to decide which one was better. I liked looking at the 3D images better because the pictures are more clear! I think that kids should go visit the Museum of Science to learn about all different things!